The MiPole is a relative newcomer to the home dance pole market. VS International is the company behind this pole, which is manufactured to their specifications in China. VSI then imports and distributes the finished product worldwide. The pole itself was developed in the United States by a team of product designers who specialize in medical furniture and apparatus. The MiPole is a portable, friction mount pole. It comes with a carrying case, a tightening tool, and a clear, easy to understand instruction booklet. Although I was cautious at first because of the low price point of the MiPole, I'm pleased to report that it tested well and seems to live up to the company's assertion that this is a high quality pole. The current retail price is $169. The major downside to this pole is that there is only one model to choose from, and no options such as a choice of finish or diameter. However, if you want a good quality, basic pole, you won't do better for the price. In fact, the strength of this company probably lies in doing one product exceptionally well. Because they focus on delivering a great quality product instead of a number of different models, they can keep manufacturing costs lower and pass the savings on to you. It kind of reminds me of this pub in my neighbourhood....they serve a super cheap, fast and tasty Saturday morning breakfast, but everyone gets the same thing and there are NO substitutions. If you don't like what's included, you order something else that costs a little more, and that buys you the right to be choosey. But if you happen to love eggs over easy, fried potatoes, bacon, brown toast and coffee, you won't find a cheaper meal anywhere. Same with the MiPole...if the features suits your needs, it's probably the best price you'll find on a decent quality dance pole. Height: The MiPole fits ceilings from 7'6" up to 9' in height. You can adjust the length by using different extension parts. The bottom extension mechanism not only ensures a secure installation, it also helps you adjust the pole to the required length. Extends to: 9 feet maximum extension (extension parts included). Material: Chrome plated steel with machined seams and a few very high quality plastic parts. Weight: Approximately 18 pounds including the carrying bag and all accessories. 22 lb shipping weight including packaging. Options:VSI offers only one basic model of pole. The MiPole does not have a rotating option, nor a choice of colors/finishes or diameters. If you have a vaulted ceiling you will not be able to use the MiPole. 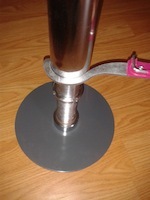 This is because it uses a friction mounting system with a rubber pad that must sit flush against a flat ceiling to provide grip (see photo to left). Because there are no screws or mounts to hold the pole in place, it's not suitable for use on a vaulted or sloping ceiling. It's important to measure accurately to ensure your ceiling height is within the required range of 7'6" to 9'. The MiPole won't fit on ceiling heights lower than 7'6", but I doubt you'd want to install it in room with such a low ceiling anyway, as it would really limit what you were able to do. Additional extension parts and connectors are available to make a longer pole. However, you should be aware that the overall strength may be reduced if these are used, therefore this practice is NOT recommended or endorsed by VSI and will void the warranty. 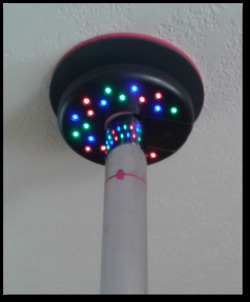 LED Light - fits any pole, not just the MiPole! This is a really fun accessory to have, and although it's exclusive to MiPole, it will easily fit on any standard dance pole and can be purchased separately. It takes 3 AAA batteries (not included) which are easy to install. 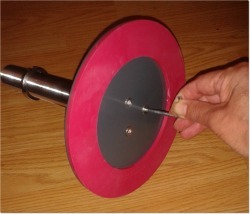 After inserting the batteries, you simply pinch to remove a small part that allows you to slip the light around your pole. 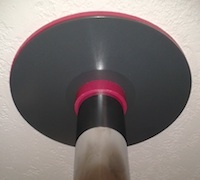 Once in place, you drop the part back in, slide the light up to the top of the pole, then tighten the rubber grip to hold it securely next to the ceiling mount. Set the switch to have the lights on steady, or flashing to the beat of your music (my favourite!). Since the multi-coloured lights are LED, they should last a good long time and draw very little power from the batteries (which are easily replaced in any case). I couldn't wait to try this light out at a pole dancing party, and it was the highlight of the night. At the end of the party, while everyone was choosing their boas, wigs and props to wear for the "performance" we always do after learning the dance routine, I hopped up on a chair and installed the light. I flicked the switch to flash to the music and let the women all take a turn showing off their moves under their own personal light show. It was a hit! If you teach classes or do parties, I can't recommend this fun little enhancement highly enough. It's inexpensive and will really add to the fun factor for your students or partygoers. As mentioned above, the MiPole is a friction fit design. The molded rubber pads on both the floor and ceiling mounts are strong, yet soft and flexible so that they can provide good contact without damaging most floors or ceilings. Keep in mind that any friction fit pole needs to be installed over a ceiling joist, exposed beam, or other sturdy support, in order for it to be safe. Also, if you have a heavily textured ceiling, the ceiling pad on a friction pole may cause some damage, ranging from minor (some of the texturing material may rub off) to fairly major (very soft and/or projecting textures may sustain noticeable damage to the finish). The potential for ceiling damage is not an issue specific to the MiPole. It's present with all types of friction mount poles, and depends entirely on whether the type of ceiling you have is suitable for use with this type of mounting system. Acoustic tile or "drop" ceilings are never suitable for friction mount poles as the panels are lightweight and are typically not supported by a joist or beam. While the MiPole is a good quality piece of equipment, it's important to keep in mind that the potential for user error is higher with any type of friction installation. Therefore, it's extra important to read and follow the installation instructions, and to proceed with caution until you feel you fully understand how to install and use this type of pole safely. One of the reasons the MiPole is priced so competitively is that it's available in only one basic model. And for people like me who get overwhelmed with too many choices, that's not necessarily a bad thing! By focusing on making one style of dance pole that will be suitable for probably 80% of potential buyers, VSI can concentrate on producing higher volumes, thereby keeping costs for the MiPole low. So what are your "non-options?" The MiPole has a stainless steel finish, a 2" (50 mm) diameter, and is a stationary model (ie it does not have a spinning/rotating option). It's available as a friction mount pole only. One of the many pleasant surprises I got when I opened up my MiPole was that it includes a carrying bag! And since the pole breaks down easily into several pieces, it's a breeze to carry with you. As you can see from the photo above, the carrying case has separate compartments, pockets and straps for all the parts, which means that all the pieces remain separated from the others so your pole won't get scratched or damaged while in transit. Unlike some other portable poles that are actually quite heavy, this one is light enough even for a very petite woman to carry. Plus, the case has both carrying handles and a shoulder strap, making it very versatile. There's also room enough to tuck in any additional accessories you might want to carry along, such as a level, stud finder, tape measure, or even the optional LED light. I do recommend that you place these items inside a cloth bag or other covering before putting them inside the carrying case though, just to make sure they don't scratch your pole. At the time of this writing, the MiPole retails for $169 U.S. I'm sure you can see why I was sceptical about quality with a price point like that! VSI explains that they can keep their prices low because they don't do any advertising. Instead, the company prefers to let word of mouth drive sales so they can save the money they would have spent on advertising, and pass those savings on to you. Of course, the fact that manufacturing, assembly and packaging are all done in China is going to impact the price as well, due to lower labour costs in that country. If buying only "made in America" products is important to you, this is something to be aware of. As far as quality goes however, the MiPole is pretty much on par with its North American made counterparts. They say you can't judge a book by its cover, but in this case the packaging speaks well of the contents. My shipment arrived in a plain brown cardboard shipping carton, with the LED light I had requested securely fastened to the exterior. The pole itself was in its own box inside the shipping carton. The first thing I noticed when I slid the contents out of the box was that someone had obviously thought through the packaging very carefully. All the pole parts were wrapped in bubble wrap and securely taped into their slots. On the reverse side to where the main pole parts were, the floor and ceiling pads, tightening tool, and the carrying case were all wrapped and strapped or taped into place. Top marks for secure packaging! It seems all precautions had been taken to ensure nothing came lose during shipment, and that the pole would arrive with no damaged parts. So far, so good. Next, I pulled out the instruction manual to get an overview of how the pole went together. At this point I was still a little worried that I'd have to decipher instructions that had been poorly translated into English. In fact, I was delighted to find clear, simple diagrams and a minimum of well-written text...just enough to explain what needed to be done without confusing me. Then I removed the packing materials and did a quick review of the parts to be sure everything was there (check) and to assess the overall quality. First up were the floor and ceiling pads. Since this is a friction mount model, these are critical parts. They need to be very sturdy to handle the load on the pole, while offering a flexible yet secure grip via the rubber pads. Both pads were solidly constructed, and the rubber was dense yet soft enough to provide the slight flex needed for a good connection with the floor and ceiling. 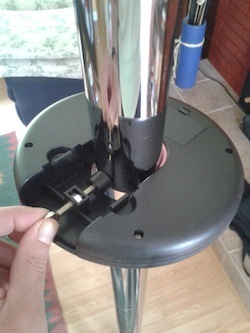 With the MiPole, the floor pad is attached to the lower part of the pole with 3 screws and an Allen key (all included). This was quick and easy to do, and if you don't need to pack your pole up flat in the bag after use, you could easily leave this part attached to save time on your next installation. The pole itself went together quite easily. The two main pieces are screwed together and although the pole is fairly light, these joints are solid so I felt quite confident in the pole's ability to carry a load. The screw joints were a tad stiff and a bit squeaky as they went together, which irritated my dog more than me. Very likely these would settle in after a few uses so it's not a big deal. To speed the process, I decided to apply a quick shot of dry silicone spray (you could also use WD40 or a similar product). That instantly resolved the stiffness and the squeak, and gave me a happy doggie once again. With the dog resuming her nap, I turned my attention to properly sizing the pole for my ceiling height. This meant selecting the correct extension tube, which simply required looking up my ceiling height on a chart and then choosing the correct combination of extension parts. It turns out that as my ceiling is 8' high, I only needed one of the extension tubes. 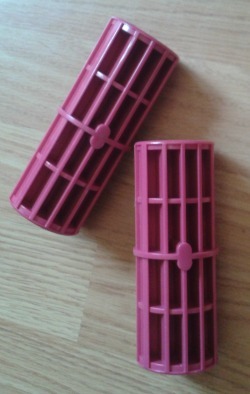 These are attached to the main part of the pole with one of two included plastic connectors. Plastic, you say? Yes, plastic. But wait! These are NOT cheaply made, easily broken, run of the mill plastic toy parts. I was actually quite impressed with the quality and durability of these connectors, which you can see in the photo just to the right. In my opinion, these parts are incredibly well made. And they should be, since they're an integral part of a structure that claims to be able to support 250 pounds of climbing, spinning, and inverting weight. Indeed, the MiPole website states that this pole can easily handle 250 lbs, which puts it in the same class as the Lil Mynx and XPole. I certainly found it to be plenty sturdy for spins, inversions and other tricks when I took it for a test ride. But back to the assembly process....I did notice some very slight imperfections in the tubing near where the two main joints screw together. This is mostly likely the result of the process required to attach the threads to the inside of the tubing. It does not affect wear or use, and isn't noticeable at all when you're dancing. It's my job to look closely and assess all the parts in detail though, so I mention this to be thorough. And while I'm being ultra-picky, I should report that my pole also had a tiny bit of a mis-match between the two halves of the main pole where they screw together. The joints themselves were fine, but where the two halves meet the seam was just a tad off, almost as though the machining process left just a small "lip" on one edge. To be fair, when I actually danced on the pole I didn't have any problem with the seam so it really was minor. Unlike my unfortunate experience with my Platinum Stages pole that had very poorly finished seams, the seams on the MiPole didn't cause any cuts or scratches...it just felt a bit uneven when I ran my hand over that part. However, if you were ever concerned about uneven or poorly machined seams (on any pole, not just the MiPole) a quick go over with a metal file would quickly take down any rough or mismatched edges. This is what I ended up having to do with my Platinum Stages pole and it worked fine after that. OK, moving along...after assembling the pole to the correct length, it was a very simple matter to pop the ceiling pad on the top, and then turn the base assembly to extend the pole a little more. Now it was time to place the pole upright and into position. This is really the test of ease of installation in my opinion. As you'll know if you've read my Platinum Stages review, I found that particular pole to be so heavy that it was almost impossible for one person to maneuver it into place. The MiPole, however, was much easier to handle as it's not nearly so heavy. After sliding it into place, I hand tightened the base so I still had some wiggle room to adjust it to be plumb. To do this, use a level on two sides of the pole, ensuring that it reads level on two adjoining sides. Almost ready to dance, but first, I needed to complete the final installation step, which was to make sure the pole was secure. 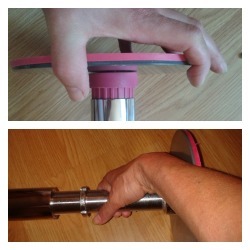 To do this with the MiPole, you use the included tightening tool to turn the lower half of the pole. This extends the base, lengthening the pole until it's wedged tightly in place between the floor and ceiling. Once it was plumb, the tightening tool made it easy to lengthen the pole so it was the proper height. There are slots on the lower half of the pole that the tool fits into, so it's easy to get good leverage. After that, a few spins of the lock nut secured everything in place. 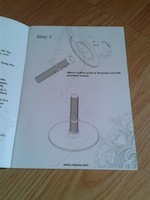 The final step was to slide the base cover down over the base assembly (see photo above). The base cover is the other part of the pole that's made of plastic, but again I found it to be of very good quality. I also liked the fact that the cover was a subtle dark grey colour and that they didn't try to make it look like stainless steel by using a chrome coating. I've seen other poles that use this, and I find the coating flakes and peels from the plastic very easily. I really like the fact that the MiPole can be put together and installed by one person, as the parts are not too heavy even when the entire pole is fully assembled. I was curious about this, so I got out my Platinum Stages and Lil Mynx poles for comparison. What I found was that the MiPole has nice, solid joints like the Platinum Stages pole, but except for these, it's hollow tubing like the Lil Mynx. The Platinum Stages pole isn't solid steel of course, but the joint pieces are bigger and have more of a solid core, which makes them much heavier. On the other hand, the tubing material used in the MiPole has a slightly thinner wall than that used in the Lil Mynx, which is part of the reason it weighs less. I tried to measure to give you an accurate picture, but that's tough when we're talking millimeters. And besides, I'm very resistant to admitting I need glasses! 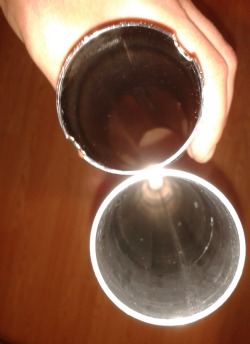 Instead, I took a photo of the two pieces of tubing together so you can see what I mean. The MiPole tubing is at the top of the photo, and the Lil Mynx is the one at the bottom. You can see that the tubing material is just a little thinner on the MiPole. Now given that the MiPole folks say their pole will easily take 250 pounds of weight, I don't believe this is significant enough to cause you to worry about this pole buckling under your weight, unless you're very, very heavy. If you truly are a very plus size pole dancer, I would probably recommend that you consider a Lil Mynx one piece pole instead of a MiPole. The slightly thicker walls of the tubing and the one piece construction are just going to give you a bit of extra strength. If you're concerned about whether a dance pole will hold your weight, you can read more about important factors in choosing a safe pole setup. VSI will ship their products to any country, however shipping costs are going to be much higher internationally than in North America due to the weight of the package. If you're in the USA, your shipping charges are a very reasonable $22. Canadian customers will pay a bit more for shipping, which varies by province. To help you budget, you can request a free, no-obligation shipping quote before you order, using the form just below in the "How To Order" section. International orders can also request a shipping quote prior to ordering. Orders are shipped the same day during the week, and on Mondays for orders received over the weekend. As they have both an east and a west coast warehouse, VSI will ship from the closest one so that you can get your pole as quickly as possible. I didn't see any warranty information on the MiPole website, but when I emailed to ask about this, the folks at VSI said that they guarantee workmanship for the MiPole, and will replace any parts due to manufacturing defect free of charge. Of course, if damage is due to misuse or neglect on the part of the customer this warranty wouldn't apply, but in that case you can purchase very reasonably priced replacements directly from the MiPole website. If you lose a part, such as the wrench tool, a plastic connector, or an extension piece, you can also purchase replacements for these. As far as customer service goes, MiPole has earned top marks in my dealings with them. Replies to my email inquiries have been prompt, friendly and detailed. My questions have all been answered in a timely and professional manner, and often additional helpful information was provided. An order confirmation and tracking information were sent within a day of my order being placed, and my shipment arrived quickly and in excellent condition. All in all, VSI appears to be a very customer-focused company with a very good product offered at an excellent price point. If you're on a budget or just looking for a decent pole at the best possible price, look no further than the MiPole! Ordering is easy...you can do it right from this page! Start by finding your country below, then just click to place your order. when ordered together with a pole. Your price for the MiPole is the same (US $169), however shipping charges will vary depending on your province (between US $30 and $60 in most cases). Please fill out the form below to receive a prompt shipping quote. You are under no obligation to order by doing so. If you approve the quote, I'll send you an invoice by email. 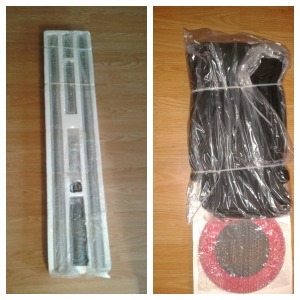 As soon as your payment is received, your pole will be on it's way! Once again, product pricing remains the same for all countries, but shipping charges will vary. For international orders, please fill out the form below to request a free, no-obligation shipping quote. I'll calculate shipping prices and options for the MiPole, the LED light and both items together. If you'd like to order one or more items, simply reply to the quote with your order and I'll invoice you and get your package off right away. Please contact me using the form below and I'll be happy to help. Want to read more dance pole reviews?